CSB-20 - CSB Sliding Bearings India Pvt. 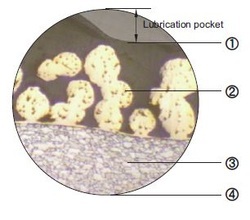 Ltd.
of circular indents which should be filled with grease on assembly of the bearing. provides max. 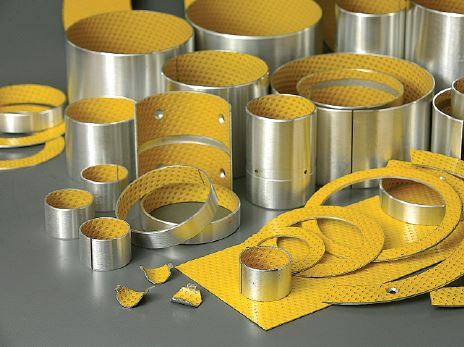 thermal conductivity away from the bearing surface, also serves as a reservoir for the resin mixture. 3. Low-carbon steel, provides exceptionally high load carrying capacity, excellent heat dissipation. 4. Copper/Tin plating thickness 0.002 mm, provides good corrosion resistance. Recommended for applications involving intermittent operation or boundary lubrication. Automotive: suspension joints, kingpin assemblies and stub axles of tucks, auto mobile driving joint hinges, steering and other linkages, articulation joints, rear chassis hinges, fair leader rollers. Machine tool building industry: spindles in drill, grinding, and milling machines, ram guide plates in multi-rampresses. Agricultural equipment: gearbox, clutch, bale trips and wheel caster swivels for bale accumulators, front axle pivot bearings, steering idler box bearings and kingpin bearings for harvesters. It is especially well-suited for applications where lubricant can not be supplied continuously or repeatedly.